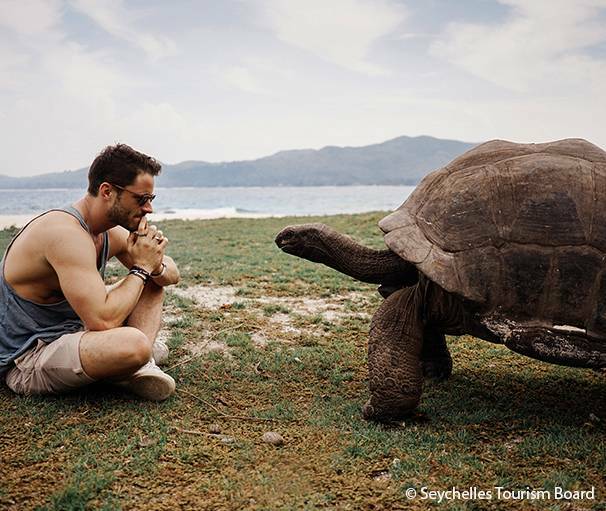 Any mention of the Seychelles evokes, first and foremost, images of powdered beaches and the turquoise ocean brimming with marine life but this archipelago is full of treasures that call for adventure, relaxation and the discovery of a cultural crossroads where continents meet. 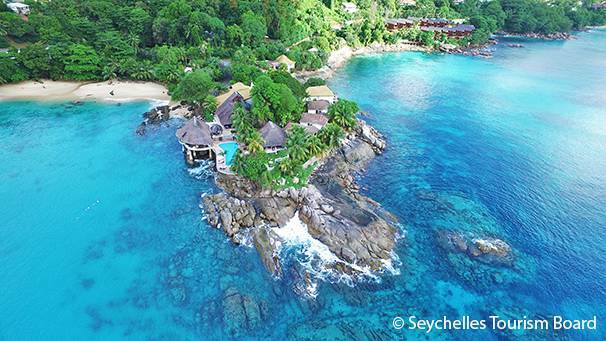 So for the newly-weds who have different expectations of what their dream honeymoon might entail, the Seychelles has it all from beaches to bask on and spas to indulge in to jungle-covered peaks to scale and crystal-clear depths to dive and explore. Whether hiking in the in the heart of Praslin island on the Plaine Hollandaise, or discovering the coastal mangroves and the 900-metre -summit of the Morne Seychellois National Park on the island of Mahé, there is enough to keep even the most ardent adventurers occupied. 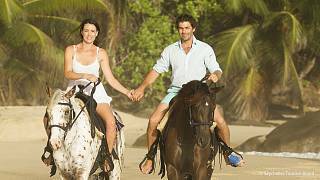 And for those who want to sample the same visual delights while taking the weight off their feet, equestrian tours are also popular and you can get well off the beaten track. The island of Praslin, the second largest in the archipelago, is also home to the enchanting Vallée de Mai, which was declared a UNESCO World Heritage site in 1983. 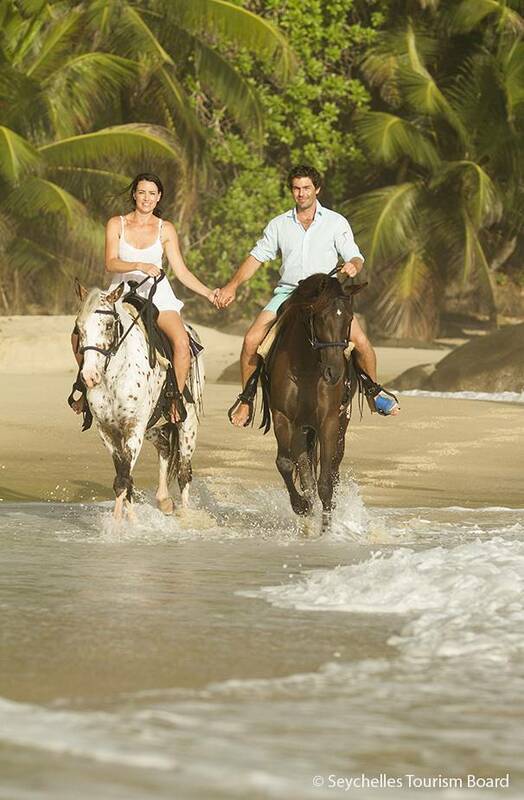 With its clear water cascades, and the centuries-old palm trees that line its winding trails, the Vallée de Mai offers young couples an unparalleled setting of beauty and romance. Cousin Island, classified as a nature reserve since 1968, is the most protected island in the Seychelles and comprises the largest number of plant and animal species in the archipelago. 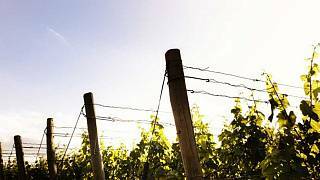 Here, you can really learn the meaning of the word “unspoiled”. The 29-hectare island is home to a wealth of endangered species that can only be found on its shores. 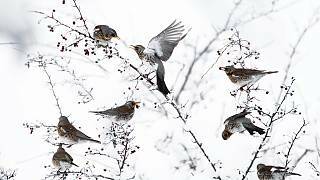 They include, among others, the Seychelles gooseberry, the toc-toc and the sooty tern. 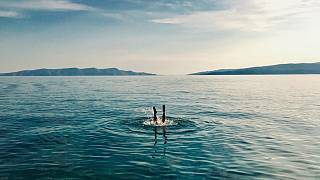 There is an abundance of Aquatic activities to choose from: diving amidst the marine life on the ocean floors, fresh-water and sea kayaking, swimming shoulder to shoulder with the gentle whale sharks or getting face to face with a giant tortoise are just some of the unforgettable activities honeymooners can choose from. 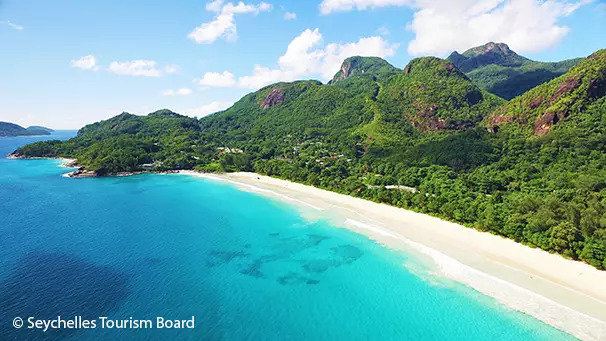 The beaches of Anse Lazio on Praslin, Anse Coco on the island of La Digue or the Marine National Park of Sainte Anne are absolute must-see attractions if you get a chance to visit the Seychelles. Although the Seychellois are predominantly African in origin, thanks to its history and location, the country is truly at the crossroads of the African, Asian, Arabic and European worlds. Here diverse cultures have blended over the centuries: Persian and Arab sailors may have frequented these islands as early as the 14th century, then came the Portuguese settlers who were succeeded by the English, French and Dutch. Each wave left their indelible mark. This has given the Seychelles its unique cuisine. 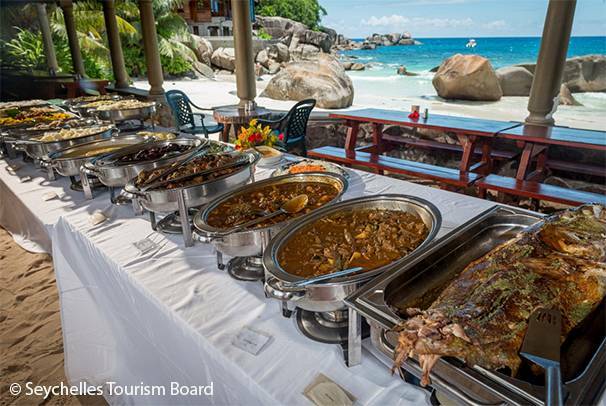 Often rice and seafood based, Seychellois cuisine can be garnished with leaves, spices, tropical fruits or even fresh flowers and is a veritable feast for the senses. Creole cooking classes are widely available and are particularly popular with tourists and honeymooners who want to deepen their knowledge of the Seychelles’ fascinating culinary heritage. For a dish you probably won’t find at home why not give the bat curry a try? 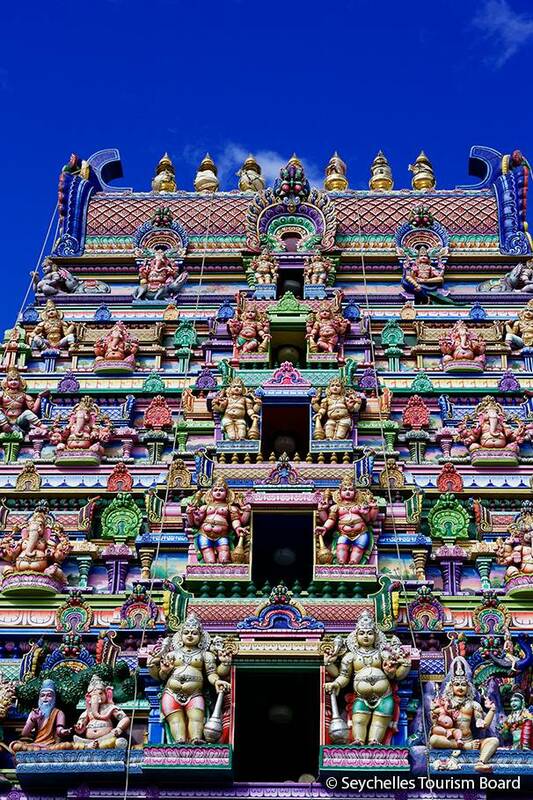 In Victoria, the Seychellois capital, you can visit the Hindu Temple to admire its unique architecture and vivid, multi-coloured, pyramidal roof. Established in 1922 in honor of the god Vinayagar, it is today a place of worship for the city’s 5,000 or so Hindus. Finally, history buffs will want to see the legendary Bel-Air cemetery, widely considered the oldest historic site in the Seychelles, it is where Victoria’s first inhabitants were laid to rest and where sarcophagi and raided tombs litter the landscape with mystery. From the 23rd-29th October 2017, Mahé will celebrate the 32nd Festival Kréol bringing together all the communities on the island to celebrate their unique “Creoleness”. Billed as “the biggest and most important event of the Seychelles cultural calendar”, it is a festival bursting with rhythm and colour that has been filling Mahé, La Digue and Praslin with music, flavours, fragrances and fun for 32 years. Painting, sculpture, dance, cooking … this is an opportunity to be enchanted by this all-embracing and fascinating cultural hotspot. In November, the Seychelles Ocean Festival (formerly Sub Indian Ocean Seychelles or SUBIOS) is devoted to showcasing the nation’s oceans and blue economy, biodiversity, seafood, sailing and more via film screenings, exhibitions, gala dinners, and sporting events. Private cruises are booming on the Seychelles: on board a prestigious private catamaran, newlyweds can enjoy the voluptuous beauty of the archipelago in intimate and exceptional settings. 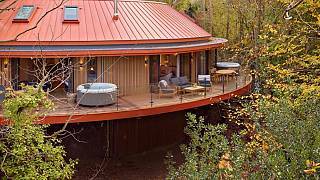 Providers often offer fishing, diving, ultralight aviation for a bird’s eye view of the ocean and lagoons and many can create bespoke stays to satisfy even the most demanding honeymooners. The Seychelles are dotted with dream hotels combining luxury and good-taste with simplicity and serenity. The Fregate Private Island is 2km long by 1km wide and is known to travelers for its granite rocks on the highest point of the island, Mount Signal, which stands at 417m and has unforgettable panoramic seascape views. As the name suggests, the island is private and bookings go through the prestigious Fregate Island Private Hotel. You can expect dinner on the beach, private pools, spa treatments, and a private butler service at any of its 16 villas … Sometimes heaven really is on earth. As voyagers who sample the exquisite natural beauty of the Seychelles are increasingly invested in ensuring its continued well being, there is an incredible choice of sustainable tourism resorts and ecological activities to choose from and that does not necessarily mean compromising on luxury either. But sometimes when nature is at its finest, it is luxury enough. Just 30 minutes by ultralight plane from Mahé is the Eco-lodge on Bird Island. Here, you don’t need any of the frills of a luxury hotel. You can choose from one of 24 simple, private bungalows that are surrounded by flora and fauna you will have to see to believe. 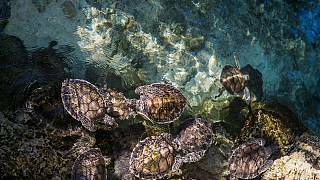 You can go on guided nature tours, swim with dolphins and whales, meet giant tortoises, go birdwatching, explore the tropical forests, or just sunbathe and swim. Conservation is at the center of everything the eco-lodge does, you can meet one of the resident conservationists like Roby Bresson who has dedicated his life to protecting the island’s birds and turtles. 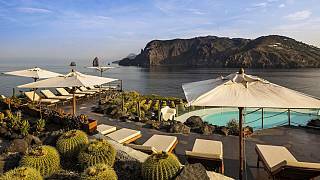 For any eco-honeymooners out there, this is a sustainably-run and incredibly fun destination for you.